The Peace-Athabasca Delta (PAD) is a large boreal wetland located in northeastern Alberta, Canada at the confluence of the Peace and Athabasca Rivers with Lake Athabasca (Figures 1 and 2). A Ramsar Convention wetland and UNESCO World Heritage Site, it is among the world's most ecologically significant wetlands. This data set contains four comma-delimited ASCII files, two of which contain water surface elevation site and measurement information and two contain water quality and ancillary parameter location and measurement data for 120 sites within the PAD. Data archived include water surface elevation and water quality parameters measured at points throughout the Delta during summers 2006 and 2007. These data sets were originally collected to improve understanding of hydrologic recharge processes in low-relief environments and to provide ground-based measurements to validate satellite observations of inundation and sediment transport. Figures 1 and 2. The Peace-Athabasca Delta (PAD) is a large boreal wetland located in northeastern Alberta, Canada at the confluence of the Peace and Athabasca Rivers with Lake Athabasca. The investigators were Pavelsky, T.M. and Smith, L.C. The Peace -Athabasca Delta (PAD) is a large boreal wetland located in northeastern Alberta, Canada at the confluence of the Peace and Athabasca Rivers with Lake Athabasca (Figures 1 and 2). A Ramsar Convention wetland and UNESCO World Heritage Site, it is among the world's most ecologically significant wetlands. Data archived here include water surface elevation and water quality parameters measured at points throughout the Delta during summers 2006 and 2007. These data sets were originally collected to improve understanding of hydrologic recharge processes in low-relief environments and to provide ground-based measurements to validate satellite observations of inundation and sediment transport. All work was supported by the NASA Terrestrial Hydrology Program under grant NNG06GE05G to the Department of Geography, University of California-Los Angeles, Los Angeles, California. More information about the Peace-Athabasca Delta, Alberta, Canada - Ramsar Site is included as a companion file Environment_Canada_PAD_Ramsar_Site.pdf. River and lake water surface elevations were measured at 9 locations within the PAD in 2006 and 12 in 2007. Athabasca R. at Pine Cr. X Logger located in mouth of small creek approximately 50m upstream of the Athabasca River. Blanche L. X X Logger located near W. edge of ~ 7 sq. km lake, approximately 200m from the lake outlet. Note that the lake outlet stream is sometimes impacted by beaver dams but is usually connected to the Richardson River. Galoot Cr. X X Logger located on small creek approximately 300m away from the Embarras River. Garouche Cr. X X Logger located on small channel connecting the Chenal des Quatre Fourches and Lake Athabasca. Grey Wavy L. X Logger located near outlet stream of ~25 sq. km lake. Note that the outlet stream is sometimes impacted by beaver dams. Grey Wavy Channel X X Logger located on small channel downstream from Grey Wavy L.
Athabasca R. at Richardson R. X X Logger located ~ 200m upstream of the Athabasca River on the Richardson River. Limon L. X X Logger located near outlet of ~6 sq. km lake permanently connected to the Athabasca River via the Richardson River. Long Portage L. X X Located near outlet of small (~3 sq. km) lake attached to Mamawi Cr. except during extreme low water. Mamawi Cr X X Located downstream of outlet from Long Portage L. on Mamawi Cr., a major distributary of the Athabasca R.
PAD 42 L. X Unnamed small lake (~2 sq. km) located near Grey Wavy Lake. Only connected to the open channel system during periods of high water. L. Claire X X Located near eastern edge of L. Claire, a very large (~1300 sq km) lake permanently connected to the open channel system. Measurement sites and frequencies are reported in pad_stage_locations_0607.csv, described below. Missing values, -999, denote that no measurements were made at that location in 2006. All water surface elevation data are reported in the data file, pad_stage_0607.csv, described below. Please note that each data column contains the water surface elevation measurements for a given location. Rows show the date and time of the measurement across locations. Please note the three (3) header records "Sites, Latitude, Longitude". "Sites" gives the full name of a measurement location that corresponds to an abbreviated form used as a column heading for the water surface elevation for that location. "Latitude" and "Longitude" contain the coordinates for the respective location. River and lake water were sampled at 120 locations within the PAD and analyzed for selected water quality and ancillary parameters. Record_Count Number of sampling events Number of sampling events and the number of data rows in pad_water_quality_0607.csv for a given location. Latitude Decimal degrees Coordinates in decimal degrees obtained using a hand held Garmin Geko 201 GPS, WGS84 Datum. Longitude Decimal degrees Coordinates in decimal degrees obtained using a hand held Garmin Geko 201 GPS, WGS84 Datum. Secchi_Depth cm Mean of two secchi disc optical depth measurements in cm, one with the disc descending in the water column, the other with the disc ascending. Wind_Speed m/s Average wind speed in m/s over a 10 -second period obtained using a hand held anemometer. Wind_Direction None Mean wind direction estimated using a compass and a small length of surveyor’s tape. Water_Depth m River or lake depth in m at the sampling location measured using one of two method s: (1) a boat -mounted sonar -based depth sensor attached to a GPS or (2) direct measurement of the length of anchor rope submerged when the anchor was located directly below the boat. All depth measurements should be viewed as approximations. Water_Temperature deg C Mean water temperature in degrees C at 1 m depth (in areas where depth > 1 m) over at least a 1-minute period. Measurements were obtained using a Eureka Manta® multiprobe. Turbidity NTU Mean Optical Turbidity in Nephelometric Turbidity Units (NTU) at 1 m (in areas where depth > 1 m) over at least a 1 -minute period. Measurements were obtained using a Eureka Manta® multiproble. Specific_Conductivity uS Mean specific conductivity in microSiemens (uS) at 1 m (in areas where depth >1 m) over at least a 1 -minute period. Measurements were obtained using a Eureka Manta® multiprobe. Total_Suspended_Solids mg/1 Water grab samples were collected at approximately 0.3 m depth in 250 or 500 mL Nalgene® plastic sample bottles. 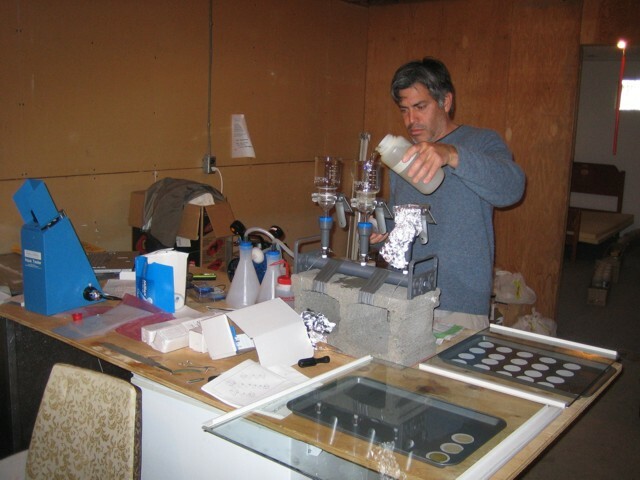 Sediment from each water sample was filtered using a vacuum filtration system (Image 4) onto a 0.1 micron cellulose filter that had been dried for 1 hour in a 110 deg F oven and then weight to 0.00 1g. After filtration, filters were dried for an additional hour at the same temperature and weighed to determine the mass of raw sediment in mg. This mass was then divided by the volume of the original water sample to produce values for Total Suspended Solids in mg/L. Inorganic_Sediment_Concentration mg/1 Filter papers with sediment were baked in ceramic crucibles at 550 C for 1 hour in a muffle furnace to remove filter and organic portion of sediments. Difference in mass between crucible without sediment and crucible with sediment after baking is recorded as the inorganic sediment mass in mg. This mass was then divided by the volume of water originally filtered to produce inorganic sediment concentration in mg/L. Surface_Flow_Velocity m/s Flow velocity was measured using a plastic drogue (Image 4), a stopwatch, and a hand held GPS. 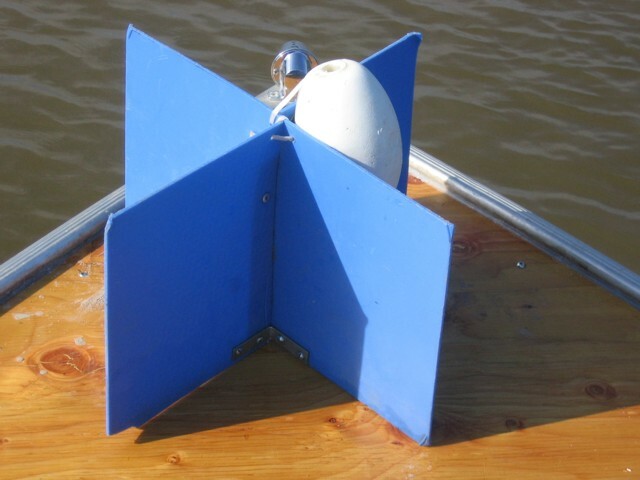 The drogue was constructed using two 22 by 28 cm rectangles of “stiff” plastic intersecting along their centerlines, with a float attached to the top. The drogue was dropped from a stationary boat into the water and the time and a GPS waypoint were recorded. The drogue was allowed to drift with the current for at least 5 minutes in most cases. On retrieval, the time in water was recorded along with a second GPS point. Velocity vectors were then constructed and flow velocity in m/s calculated by dividing distance between the GPS points by the time the drogue was in the water. Negative velocities imply flow direction contrary to the usual direction of flow for a location. The data set covers the period 2006/06/03 to 2007/09/10. These data sets were originally collected to improve understanding of hydrologic recharge processes in low -relief environments and to provide ground -based measurements to validate satellite observations of inundation and sediment transport (Pavelsky and Smith, 2008). This data set can be considered final and have been checked for consistency within and across individual variables. A quantitative assessment of the data's uncertainty has not been conducted. Figure 3. 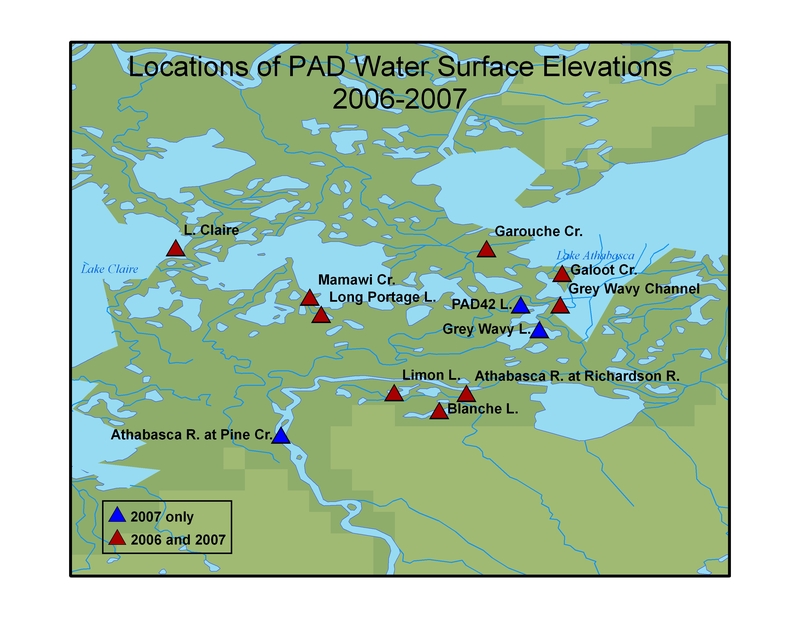 Water surface elevations were measured at 9 locations within the Peace Athabasca Delta (PAD) in 2006 and 12 locations in 2007. Figure 4. Solinst Levelogger used to measure water levels. Water quality and ancillary parameters, inclulding Secchi disc depth, turbidity, specific conductivity, water temperature, water depth, wind speed, total suspended solids (TSS), inorganic sediment concentration (Fig. 6), and surface flow velocity (Fig 7.) 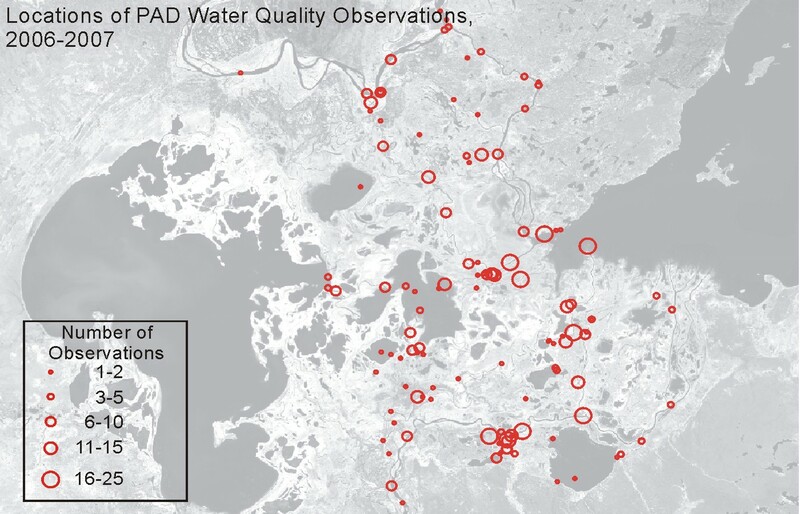 were measured at 120 locations within the Peace-Athabasca Delta during the summers of 2006 and 2007 (Figure 5). Data were collected multiple times at many locations, with the total number of observations ranging from 1 to 25 for a given location. Not all variables were measured for all locations. The locations where data were collected and the number of data revisits for each site are included in pad_water_quality_locations_0607.csv, and the actual water quality data are archived in the file pad_water_quality_0607.csv . A complete description of all variables, including units and collection methods, is provided in Section 2 of this document in the table for the Data File Description, pad_water_quality_0607.csv. Figure 5. 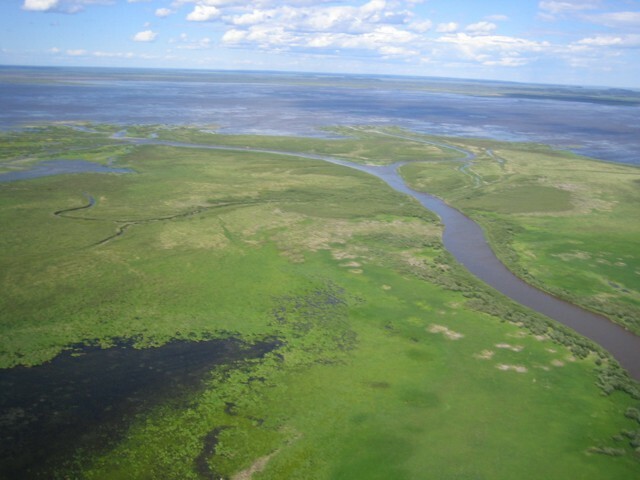 Water quality and ancillary parameters were measured at 120 locations within the Peace-Athabasca Delta during summers 2006 and 2007. Figure 6. Suspended soilids filtration equipment. Figure 7. Drogue used to measure surface flow velocity. Smith, L.C. and T.M. Pavelsky. (accepted, 2009). Remote sensing of volumetric storage change in lakes. Earth Surface Processes and Landforms. Pavelsky, T.M. and L.C. Smith. (in review, 2009). 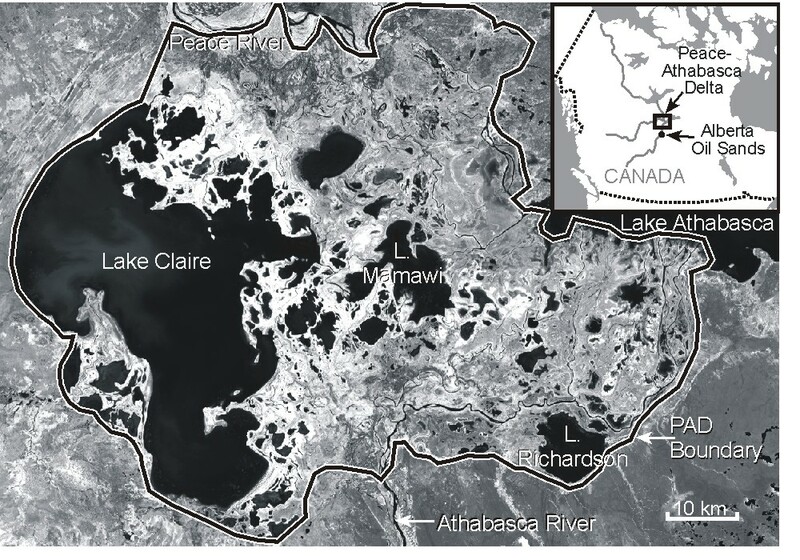 Remote sensing of suspended sediment concentration, flow velocity, and lake recharge in the Peace-Athabasca Delta, Canada. Water Resources Research.